I haven’t really done much exploring for Italian subs. 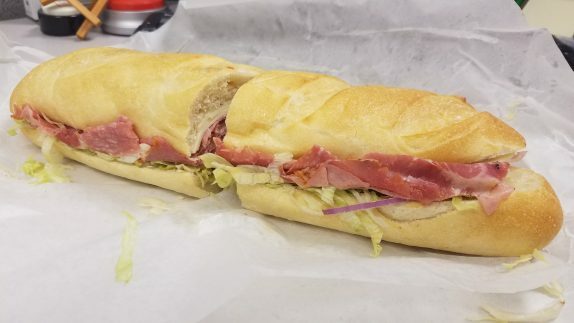 I mean, I did check out Fiorello Imports a while back, but in all honesty, I don’t really get in the mood for Italian subs often. It’s probably from all those years of making dozens of them a day. Pellegrino’s has been recommended to me as probably one of the better subs in the vicinity of work. And when I say vicinity, I mean within a 10 minute drive of Guilderland. One day, I went down during a lunch break to check out the shop and take a sub back to work. I took a stroll through their shop and saw a lot of familiar things. What they sell is a simplified selection of what’s at Roma in Latham, which I always thought was comedically expansive for no good reason other than to fill space. One thing I was looking for in their soda case was Manhattan Special Coffee Soda. That’s one of my favorite things to drink with an Italian sub. They didn’t have it, but they did have Pellegrino Aranciata (a different Pellegrino, i.e. the sparkling mineral water company), a slightly bitter orange soda I used to love but haven’t sought out in years. When I got to the deli counter, which is a beautifully disorganized mess that is totally indicative of the Italian deli experience, I was greeted by a familiar face. I was home. I ordered my sub, and it took the young man just about as much time as it would for me to make if I were slicing to order. By the, the line was back to the door. 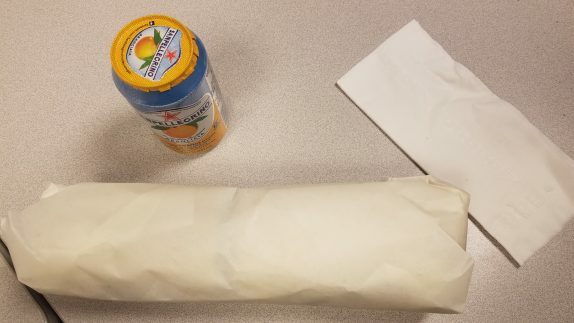 The same guy cashed me out, and for about $10.50, I made it out with my sub and a can of aranciata. The sub was listed at $8.49, so the soda must have been under $2, which was a bit of a surprise since these imported sodas sometimes get a higher price tag because they’re imported. On first glance, it was very different from the Italian subs I’ve seen around here. For starters, it was on a long roll; I mean it was massive. If Subway made their bread this big, they wouldn’t have gotten sued for not giving out footlongs. 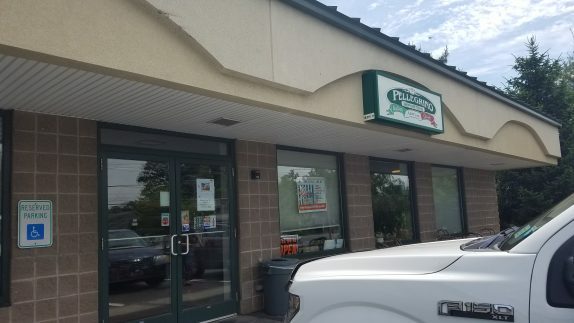 Pellegrino’s procures their bread from Priznos on Delaware Ave in Albany, and it was a really good quality roll. From the slightly crusty and chewy exterior, it was clear this was a fresh roll. The meats inside of the roll were also unique. 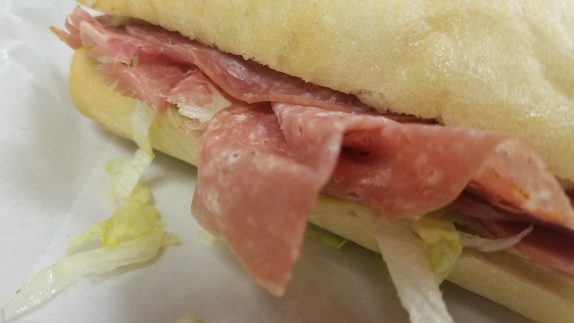 Normally, an Italian mix is ham (or a variant like capicolla or proscuitto cotto), Genoa salami, and provolone. The Italian mix at Pellegrino consisted of Genoa salami, mortadella, capicolla, and provolone. The meats were sliced expertly thin, the kind of thin I used to get in trouble for because shards of meat would build up inside of the slicer. 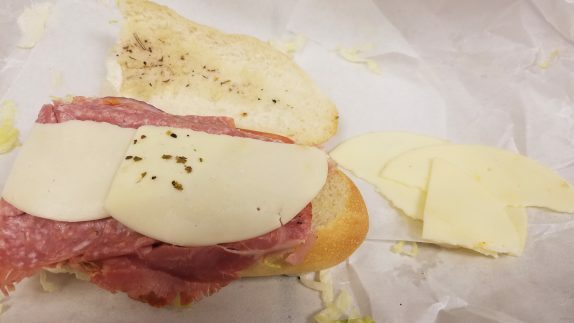 There was almost three times as much provolone as I like in my sandwich, so I took the liberty of removing some. Since I was at work that day, I skipped the onions and opted for lettuce, tomato, and light oil and vinegar (a concoction prepared in house with lots of oregano). 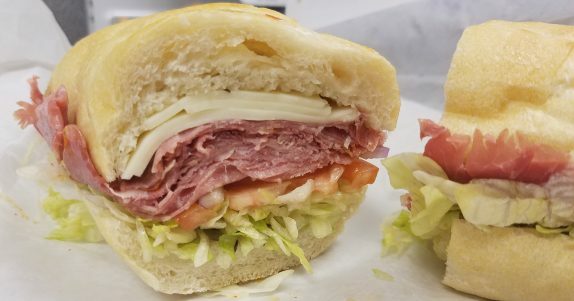 This kind of sub needs the crunch of the lettuce as well as some red wine vinegar to cut through the rich meats. The only thing missing was some hot peppiz (aka peppers), which I intended to order but forgot. 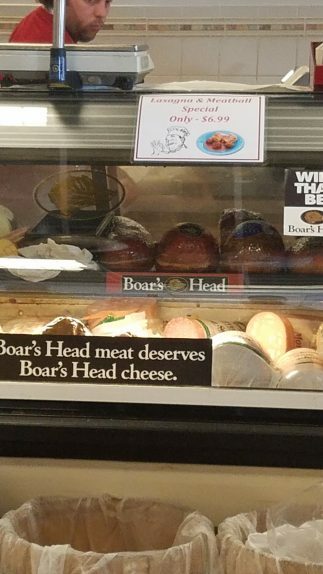 All of the little touches scattered throughout the store (wooden barrels with dried beans, imported cheeses, random mismatched signs) reminded me of the types of Italian deli I was brought up to know. I’d definitely recommend checking it out if you’re looking for the stuff they sell.